As often is the case, Oklahoma has more than one conservative candidate. Such is the case with this year’s June 27th primary and the two leading Republic candidates Mary Fallin, currently a U.S. Congresswoman and previously an Oklahoma Lt. Governor, and Randy Brogdon, currently a state senator. The leading Democrat opponent is State Attorney General Drew Edmondson. I’m an Oklahoma native and I don’t want to see another Edmondson leading this state. There was Ed and J. Howard, now Ed’s sons Drew and Jim Edmondson, an Oklahoma Supreme Court Justice. Fallin has a impressive lead over Drew Edmondson in the polls, and is the obvious best choice to keep Edmondson out of office. On July 7th, Oklahoma pollster Scott Rassmussen has Fallin ahead of Edmondson 48% to 39%. Edmondson leads every Republican on the ballot by double digits, including Randy Brogdon, with the exception of Mary Fallin. Mr. Brogdon polls behind Drew Edmondson 48% to 36% [12 pts]. The July 7th poll has a margin of error of +/-4.5%. 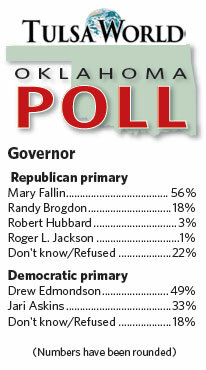 The Tulsa World poll above shows Brogdon as Fallin’s closest competitor and he trails her by 38 points. While visiting OkiePundit today, a great site for Oklahoma and election news (I borrowed the Tulsa World graphic above from them) I found a link to this tidbit: The Competitive Enterprise Institute has named Drew Edmondson the the Nation’s third worst State Attorneys General behind California’s Jerry “Moonbeam” Brown and Connecticut’s Richard Blumenthal, who recently “misspoke” about his military service. No, I do not want Edmondson in the Governor’s Mansion. The campaign has been an unpleasant one between Fallin and Brogdon – or maybe Brogdon against Fallin is the unpleasant part. The two main charges against Fallin is that she took money from bailout recipients and she voted for TARP. I’m not holding anyone too responsible for the $700 million 2008 TARP, except Democrats. Yes, yes, I know, it was on Bush’s watch, but it was the Democrat Congress who fell asleep at the wheel, kept the CRA program rolling all the while knowing that Fannie Mae and Freddie Mac were explosive – and the Bush administration made 17 attempts to get the Democrat Congress to crack-down on the risky lending – all to no avail. Then there was no Congressional oversight of the SEC, as mandated – so RINO/Democrat Henry Paulsen was left to draw up the plan and present it to a shocked nation. Many voted for TARP who wish they had not done so today. We were in new territory and the knee jerk reaction was our economy would collapse. Today we know better, Then we didn’t. Brogdon said Fallin took donations from bailout recipients, but according to NewsOn6.com she received $5,000 from the CEO of an Oklahoma bank that did receive bailout funds. A spokesperson said the CEO was a long-time supporter of Fallin. 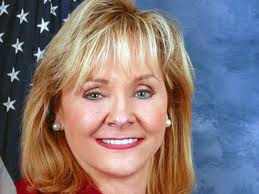 Brogdon also hit on her “earmarks,” which Newson6 confirmed was not a traditional earmark, but was $8.5 million in stimulus money for Oklahoma National Guard projects in Oklahoma City and Braggs, although Fallin voted against the Stimulus. This reminds me of a comment made by Oklahoma U.S. Senator Jim Inhofe. I have to paraphrase, but I think I’ll get the spirit of it right: if the government is handing out money, take it for your State, because if you do not, the Democrats will get it. In other words, when you turn down funds of this type, don’t be so naive as to think it goes back to an account and collects interest for the good of the country. According to Inhofe, it becomes a slush fund for the President. I’m voting for Fallin in the primary. I believe she will do Oklahoma proud.